Jason Varitek reached the height of his professional success in 2007. The Red Sox won their second World Series in four years and he was at the center of it all as the catcher and team captain. Life was a series of champagne celebrations and adulation. But Varitek’s joy was tempered with the knowledge that his marriage of nearly 13 years was coming to an end. It was only the beginning of what Varitek now calls “a time of transition’’ in his personal and professional life. He filed for divorce 10 months after the Series, then lost his job as the everyday catcher midway through the 2009 season when the Red Sox traded for Victor Martinez. In 2010, just as spring training was starting, Varitek learned that his father had lapsed into a coma and was near death. He rushed to Orlando and spent one agonizing afternoon searching for Joe Varitek’s living will. His father pulled through. But Varitek’s career took another downturn when he broke his right foot last June, the injury leading to speculation that his tenure in Boston — if not his career — could be over. At the same time, Varitek was learning the complicated process of being a single father, having gained split custody of his three daughters. 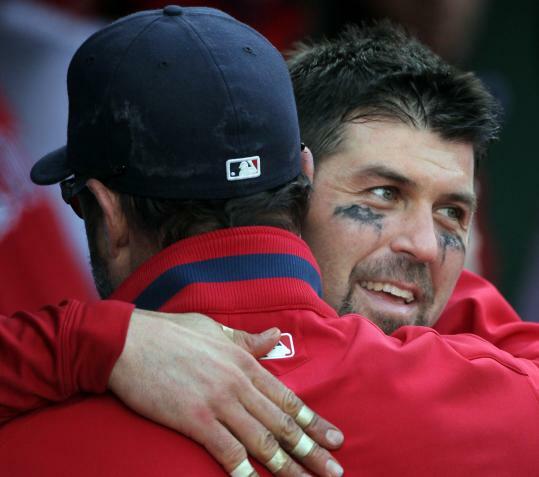 Sitting in the dugout hours before a recent game, Varitek readily admitted to needing help. He underwent “hundreds of hours’’ of counseling, learning more about himself and how the changes in his life had affected him. For the first time, Varitek also discussed his readiness to try marriage again and the woman he recently asked to take that step. After years of zealously guarding his privacy, one of Boston’s most respected athletes threw open a window to his personality. Winning her over Catherine Panagiotopoulos was not too impressed the first time she met Varitek. It was at a charity event hosted by Beckett last summer at the Lucky Strike Lanes across from Fenway Park. For starters, he used a wingman. They met again a few weeks later at Howl At The Moon, a piano bar in Boston. As Panagiotopoulos chatted with a group of friends, Varitek barged in and introduced himself again. But they started talking and exchanged phone numbers. Six weeks of calls and text messages followed, but she steadfastly refused his entreaties to try dating. Panagiotopoulos agreed to give romance a try and quickly fell for Varitek, 39. Varitek proposed to Panagiotopoulos earlier this month at a surprise birthday party she planned for him. They have not yet set a date. Panagiotopoulos has “embraced all aspects’’ of their relationship. Varitek married his ex-wife, Karen, when he was 23 and just out of Georgia Tech. Their breakup was difficult and he still has regrets. “Divorce isn’t anything I’d wish upon anyone,’’ Varitek said. “To have to go through that, it’s not a fun thing. It wasn’t fun for her, it wasn’t fun for me, it wasn’t fun for the kids. It wasn’t fun for families on both sides. Now, with Panagiotopoulos, Varitek is ready to try again. “She’s been such a huge support not only for me and for my girls, for my life and who I am as a person and allowed me to be the person that I am. It’s been great,’’ he said. ‘I’m just their dad’ You remember Varitek punching Alex Rodriguez in the face, instigating a memorable brawl with the Yankees in 2004. Or watching him block the plate with apparent disregard for his own safety. What you don’t know is how quickly he can put hair into a ponytail. Or that Belle is his favorite Disney princess. That’s what comes with being a father to three girls. Alexandra is 11, Kendall 9, and Caroline 5. Varitek and his ex-wife live a few miles away from each other in the Atlanta suburb of Suwanee. The girls spend most of their time there, and parts of the summer in Boston. Varitek’s trainer and personal assistant, Leslie Eddins, says the tough-guy catcher is happiest when his house is full of kids. Varitek talked to his daughters before he proposed to Panagiotopoulos. Their approval had to come first. After so many years in the male-dominated world of baseball, Varitek leads a different life away from the field. All about the team Varitek has been a major leaguer for parts of 15 seasons, all of them with the Red Sox. Only three players — Hall of Famers Ted Williams, Carl Yastrzemski, and Jim Rice — have spent more time with the team without playing for another franchise. Varitek has caught a team-record 1,430 games. Four of those were no-hitters, a major league record. He also has represented the team in countless charity endeavors around Boston. Varitek received a standing ovation from the Fenway Park crowd last Oct. 3 when he was taken out of the game in the ninth inning. It was a tribute and a possible farewell. Jared was in the stands applauding his brother, as were Catherine and his daughters. After the game, in the Red Sox family room adjacent to the clubhouse, Varitek tried to get his brother to lighten the mood. When Martinez signed with the Tigers, the Red Sox made a deal to bring Varitek back within 24 hours. He reported to spring training looking more like a linebacker, not an aging catcher. Varitek has embraced a backup role, working closely with the pitchers and tutoring first-stringer Jarrod Saltalamacchia. The changes in his personal life and the lessons learned in therapy have helped Varitek adjust to his new role. “My first reaction to things is I’m quiet,’’ he said. “But now I’m able to joke around, make some guys laugh in the clubhouse, make them laugh in the dugout, but yet still can take my job seriously. The players have noticed the changes. Varitek, more than ever, commands their respect. Striking a balance Joe Varitek is driving again and soon may see his son play in person, perhaps in June when the Sox play the Rays in St. Petersburg. Their father’s illness brought the brothers even closer. Alexandra, Kendall, and Caroline play for their own sports teams now. “I try and stay quiet and just watch,’’ Varitek said. The Red Sox have won eight of their last nine games after a rough start and the team is 6-2 when Varitek starts.